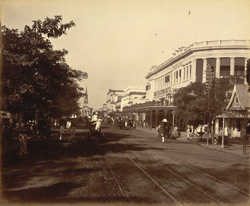 Photograph, from an album of 62 views of India and Ceylon. The print is unsigned but probably by Johnston & Hoffmann. The view looks north along Old Court House Street towards St Andrew''s Church, with the Great Eastern Hotel in the right foreground.